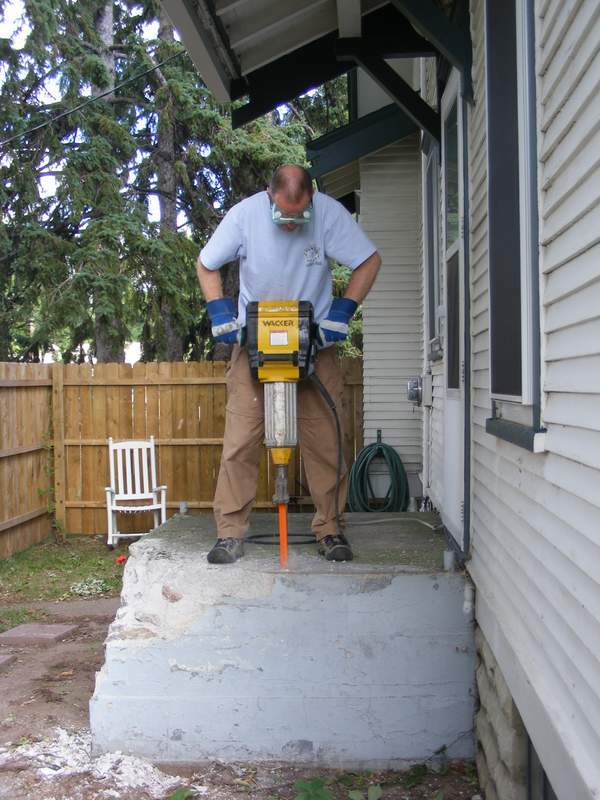 Following an unsuccessful sledgehammering, we rented a jack hammer to demolish the concrete steps leading to our side door. I was pretty sure a jack hammer would easily get the job done. I hadn’t reckoned with coming up against the world’s most durable stoop. It was Friday the Fourth of July when I started up the jack hammer. Pretty quickly, I realized that this was not going to be as easy as I first thought. 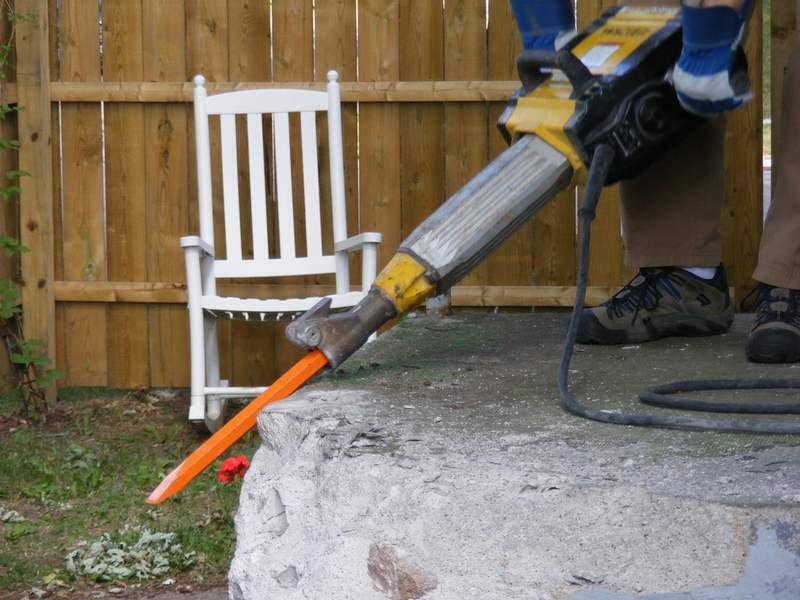 The chisel tip was bouncing around on the surface, rather than digging into the concrete. Not a good sign. The concrete was the hardest I ever came across. I since learned, from a local builder, that they used a special method for making this type of concrete. Apparently, builders of old would use a dryer than normal concrete mix, and pound it to remove air pockets. 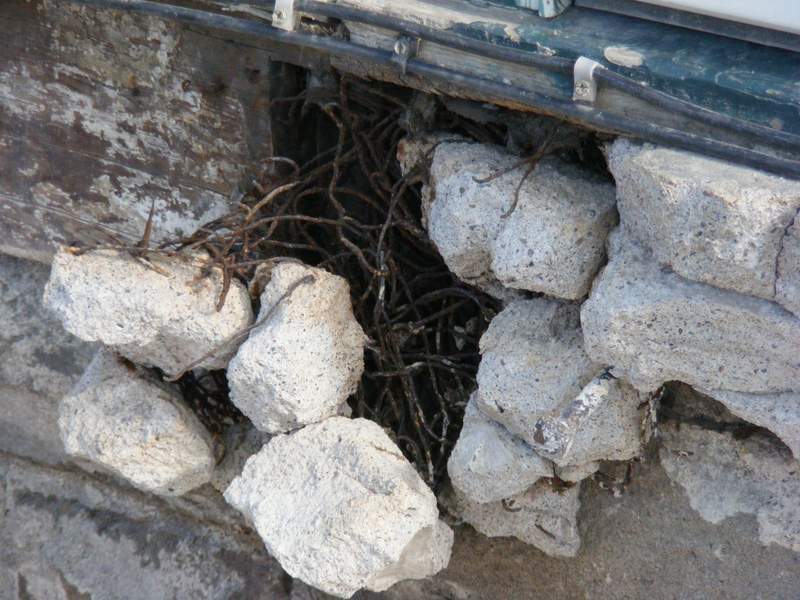 Normal concrete has small pockets of air that make it weak to shearing forces. There was nothing weak about this concrete, and every crack and break had to be worked for. I tried jack hammering close to the edge. Yes! Some small pieces broke off. But the rest was not going to break apart very easily. As the concrete began to break up, I found rocks embedded in it. The builders used granite field rocks to take up space. I presume this was to save on concrete. Initially, I thought this was a good thing. I imagined that I could dig between the rocks with the jack hammer, and they would break apart. That didn’t really happen. At first I couldn’t see why the stoop wasn’t coming apart the way I thought it should. Then I saw a piece of steel in the concrete and began to realize what I was dealing with. The stoop had been constructed in layers with wire laid in a three-dimensional mesh pattern. This was very effective at binding the whole structure together. We used heavy duty wire cutters on every piece of wire that was uncovered. 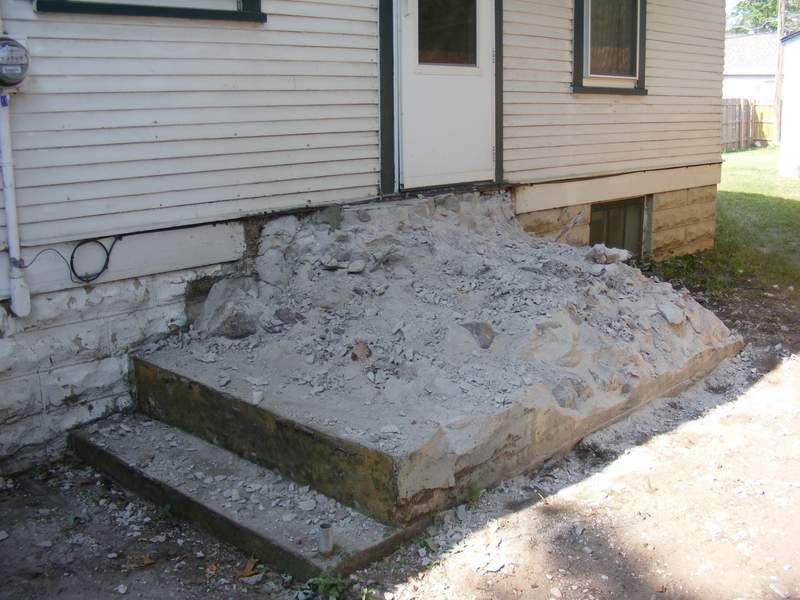 It was extremely painstaking work and was the main reason that it took us two full weekends to demolish that stoop. Steps gone (at last). 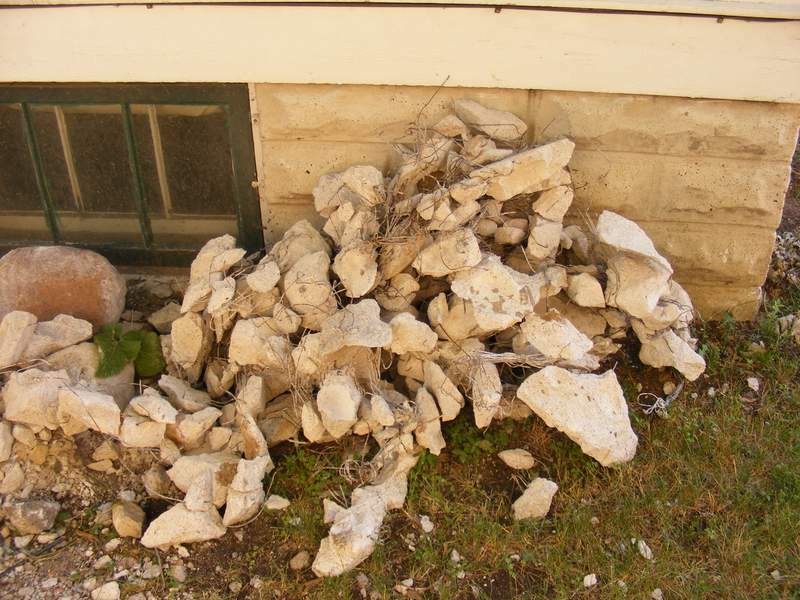 The rocks and bits of concrete in the picture are only a small part of the total stuff we got out of that stoop. There was one fun part to that job. We found a time capsule had been left in the stoop. The stoop builders had stuffed a newspaper, dated July 1946, into an old paint tin and built the stoop around it. We joked that the front page headline should read Man Builds World’s Most Durable Porch. So, that stoop had stood for fifty-six years, and would have remained standing for many more. In fact, I imagine that if a cataclysmic event had destroyed everything else around here, those steps would have remained standing, Ozymandias-like, to be discovered by future archaeologists. 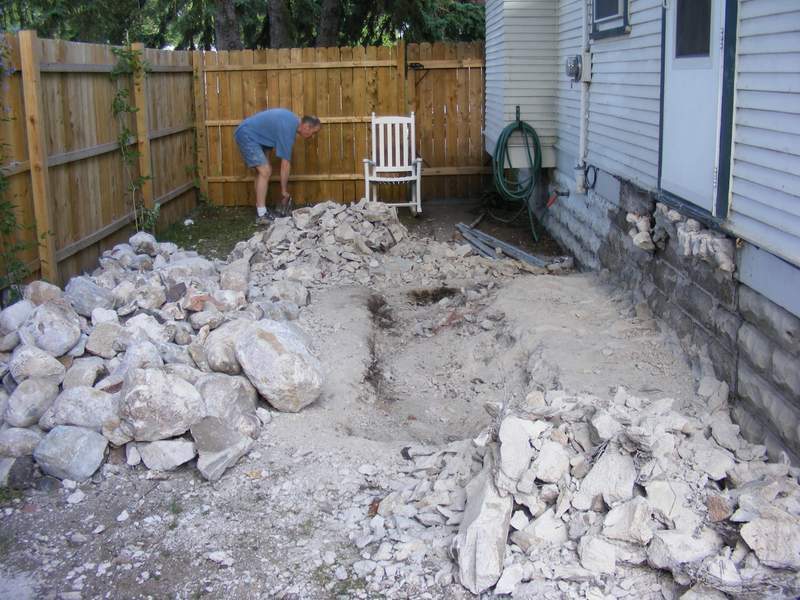 This entry was posted in Before & After, Construction, D'oh!, Outdoor Building Projects, Porch and tagged concrete demolition. Bookmark the permalink.